The present-day Tibetan plateau, which is the largest highland on Earth, formed primarily due to the India-Asia collision since 50–60 Ma. The development of the plateau has been associated with the Cenozoic development of two large intra-plateau sedimentary basins in north-central Tibet: the Qaidam and Hoh Xil basins to the north and south of the Eastern Kunlun Range, respectively. We conducted an integrated study of these two basins and the Eastern Kunlun Range that separates them to understand the timing and mechanisms of their development in order to decipher the growth and uplift history of the plateau. Crustal shortening in the Fenghuoshan-Nangqian and Qilian Shan-Nan Shan thrust belts initiated no later than the early Eocene, which formed the northern and southern boundaries of the combined Hoh Xil and Qaidam basins in central Tibet. The distinct two-stage development of the Hoh Xil basin suggests emergence of a topographic barrier between the Hoh Xil basin in the south and Qaidam basin in the north in the early Neogene, which is supported by the existing and new apatite fission-track data from the Eastern Kunlun Range that suggest rapid cooling after ca. 20 Ma. Previous and newly collected geochronological, petrological, and thermochronological data are best interpreted in the context of the Paleogene Paleo-Qaidam hypothesis, which requires Hoh Xil and Qaidam basins to have been parts of a single integrated basin during the early stage of the Cenozoic Tibetan plateau development. The formation of continental crust in magmatic arcs involves cooling of hot magmas to a relatively colder crust enhanced by exhumation and hydrothermal circulation in the upper crust. To quantify the influence of these processes on the thermal and rheological states of the crust, we developed a one-dimensional thermal evolution model, which invokes conductive cooling, advection of crust by erosion-driven exhumation, and cooling by hydrothermal circulation. We parameterized hydrothermal cooling by adopting depth-dependent effective thermal conductivity, which is determined by the crustal permeability structure and the prescribed Nusselt number at the surface. Different combinations of erosion rate and Nusselt number were tested to study the evolution of crustal geotherms, surface heat flux, and cooling rate. Simulations and scaling analyses quantify how erosion and hydrothermal circulation promote cooling via increasing total surface heat flux compared to pure conductive cooling. Hydrothermal circulation imposes intense short-term and persistent long-term cooling effects. Thinner, warmer, fast exhuming crust, with higher permeability and more vigorous hydrothermal circulation, leads to higher steady-state total surface heat flux. Hydrothermal cooling at steady state is more effective when the Péclet number is small. Hydrothermal cooling also changes crustal rheological state and thickens the brittle crust. This in turn promotes the initiation of brittle deformation in the upper crust in magmatic arcs or in regions undergoing exhumation. Interpretation of low-temperature thermochronological data could overestimate average cooling rates if hydrothermal cooling is not considered. The Eastern Kunlun Range in north Tibet, located along the northern margin of the eastern Tethyan orogenic system, records evidence for continental break-up and ocean development in the Neoproterozoic, Paleozoic-early Mesozoic subduction and continental collision, Mesozoic intracontinental extension, and Cenozoic contractional deformation. The Kunlun region is marked by active left-lateral strike-slip deformation of Kunlun fault system, one of the major intracontinental strike-slip faults in Tibet, that developed in response India-Asia. To better constrain the tectonic evolution of the Eastern Kunlun Range and the closure of the various Kunlun oceans, we conducted detailed investigation integrating new geologic mapping, geochronology, and whole-rock geochemistry with a synthesis of existing datasets across north Tibet. The Eastern Kunlun Range experienced three major deformation events in the Neoproterozoic, early Paleozoic, and Late Paleozoic-early Mesozoic, which were associated with collision of the Proto-, Paleo-, and Neo-Kunlun arcs, respectively. Our new detrital zircon analyses from Mesoproterozoic-Cenozoic strata constrain stratigraphic age and sediment provenance and highlight the importance of three periods of arc activity. Our stratigraphic synthesis, including new field observations, provides new insights into connections between sediment dispersal and changes in tectonism and paleogeography. Miocene-to-present strike-slip activity on the Kunlun fault and the associated strain pattern can be explained by clockwise rotation of the Kunlun fault and its wallrock as a bookshelf-fault system, which has been proposed for northern Tibet as a result of distributed north-south right-lateral shear. The development of this fault system was facilitated by the presence of a Triassic suture that provided a pre-existing weakness. The Cenozoic India-Asia collision generated both the east-trending Himalayan orogen and the north-trending Eastern and Western Flanking Belts located along the margins of the Indian subcontinent. Although the tectonic development of both flanking belts is key to understanding mechanisms of continental deformation during indenter-induced collision, few field-based studies coupled with geochronological and geochemical methods have been applied to these tectonic domains. In this study, we investigate the lateral correlation of lithologic units between the northern Indo-Burma Ranges, the northernmost segment of the Eastern Flanking Belt, and the eastern Himalayan-Tibetan orogen by integrating field observations, U-Pb zircon geochronology, and whole-rock geochemistry. Our findings provide new quantitative constraints to interpretations that the northern Indo-Burma Ranges expose the eastward continuation of several lithologic units of the Himalayan orogen and Lhasa terrane. Our field work indicates that a stack of thrust-bounded lithologic units is present in the study area. The northernmost and structurally highest Lohit Plutonic Complex consists of Mesoproterozoic basement rocks (~1286 Ma) and late Jurassic-Cretaceous granitoids (~156-69 Ma) with positive ƐNd values and initial 87Sr/86Sr ratios of ~0.705, which are correlative to the Bomi-Chayu complex and the northern Gangdese batholith, respectively. The structurally lower Tidding-Mayodia mélange complex, composed of basalt, gabbro, ultramafic rocks, and mafic schist of a dismembered ophiolite sequence, is interpreted in this study as the eastward extension of the Indus-Yarlung suture zone. Structurally below the suture zone are the Mayodia gneiss and Lalpani schist, which are interpreted to correlate with the Lesser Himalayan Sequence based on comparable metamorphic lithologies, negative ƐNd values, and similar Mesoproterozoic-Cambrian detrital zircon age spectra. In contrast to the above metamorphic units, the structurally lowest Tezu unit consists of siliciclastic strata that may be correlated with the Miocene-Pliocene Siwalik Group of the Himalayan orogen. Despite the above correlations, notable Himalayan-Tibetan lithologic units are absent in the northern Indo-Burma Ranges, including the Mesozoic-Cenozoic southern Gangdese batholith belt and its cover sequence of the Linzizong volcanic rocks, Xigaze forearc basin, Tethyan Himalayan Sequence, and Greater Himalayan Crystalline Complex of south-central Tibet and the central Himalaya. We interpret the absence of these lithologic units to be a result of a greater magnitude of crustal shortening and/or underthrusting of the Indian cratonal rocks than that across the Himalayan orogen to the west. This interpretation is supported by a southward decrease in the map-view distance between the active range-bounding thrust and the Indus-Yarlung suture zone in the northern Indo-Burma Ranges, from ~200 km in the north near the eastern Himalayan syntaxis to ~5 km in the south across a distance of ~200-300 km. The growth of the Tibetan Plateau resulted primarily from India-Asia convergence since initial collision at 65–55 Ma. The Cenozoic Qilian Shan thrust belt and the left-slip strike Haiyuan fault system together define the northeastern margin of the plateau. Although these thrust and strike-slip fault systems play an important role in accommodating continental convergence, our knowledge of the temporal and spatial distribution of upward and outward growth of the northeastern Tibetan Plateau is still lacking. In this study, we integrate new geologic mapping and low-temperature themochronometry (apatite- and zircon-fission-track ages) to provide constraints on the uplift and cooling history of the North Qilian Shan and the initiation of the Haiyuan fault. Cooling ages and thermal history modeling from a traverse across a prominent restraining bend on the Haiyuan fault suggest the North Qilian Shan experienced a three-phase cooling history, including: (1) broad cooling during the Late Triassic to early Cenozoic, (2) long-term tectonic quiescence from late Cretaceous to middle Miocene, and (3) rapid cooling and exhumation from ~15–10 Ma to present. We relate this most recent local cooling (~15–10 Ma) to the initiation of strike-slip faulting along the central Haiyuan fault, which corroborates other recent studies, suggesting a middle Miocene activation of strike-slip deformation along the Haiyuan fault in northern Tibet. ​The involvement and location of the Neoarchean-Paleoproterozoic North China craton in the supercontinent Columbia remains enigmatic, and the tectonic history along its margins impacts our understanding of connections between North China and other continents. Here we present structural observations from a Paleoproterozoic mélange that is located along its northern margin and which we refer to as the Bayan Obo mélange. It is composed of a structurally complex tectonic mixture of metapelites and metasedimentary rocks mixed with exotic blocks of ultramafic-mafic rocks, meta-basalts, metacarbonate and alkaline rocks, and tonalite-trondhjemite gneisses (TTG). New zircon geochronology of the various constituent blocks suggest that it formed, and was subsequently deformed, at ca. 1.9 Ga. The oldest intra-mélange blocks are 2.45-2.54 Ga TTG rocks and granitoids that signify the stabilization of the northern North China in the Neoarchean-Paleoproterozoic. A ca. 2.45 Ga plagiogranite block probably originated by partial melting of the older TTG rocks. We suggest this mélange formed in a sedimentary setting near the subduction trench, on the basis of mixing of upper and lower plate volcanic rocks and textural relationships. The Bayan Obo mélange thus represents one of the oldest documented sedimentary mélanges on Earth, yet its fundamental characteristics strongly resemble Phanerozoic subduction complexes. Based on similar ages and styles of deformation, this zone may represent the ca. 1.9 Ga collisional zone between North China and the southwestern margin of the Siberia craton. In this context, the North China craton became an integral component of the supercontinent Columbia starting at ca. 1.9 Ga.
​The Qilian Shan, located along the northeastern margin of the Tibetan Plateau, experienced multiple episodes of tectonic deformation, including Neoproterozoic continental break up, early Paleozoic subduction and continental collision, Mesozoic extension, and Cenozoic intracontinental orogenesis resulting from the India-Asia collision. In the central Qilian Shan, pre-Mesozoic ophiolite complexes, passive-continental margin sequences, and strongly deformed forearc strata were juxtaposed against arc plutonic/volcanic rocks and ductilely deformed crystalline rocks during the early Paleozoic Qilian orogen. To better constrain this orogen and the resulting closure of the Neoproterozoic-Ordovician Qilian Ocean, we have conducted an integrated investigation involving geologic mapping, U-Th-Pb zircon and monazite geochronology, whole-rock geochemistry, thermobarometry, and synthesis of existing data sets across northern Tibet. The central Qilian Shan experienced two phases of arc magmatism at 960–870 Ma and 475–445 Ma that were each followed by periods of protracted continental collision. Integrating our new data with previously published results, we propose the following tectonic model for the Proterozoic-Paleozoic history of northern Tibet. (1) Early Neoproterozoic subduction accommodated the convergence and collision between the South Tarim-Qaidam and North Tarim-North China continents. (2) Late Neoproterozoic rifting partially separated a peninsular Kunlun-Qaidam continent from the southern margin of the linked Tarim-North China craton and opened the Qilian Ocean as an embayed marginal sea; this separation broadly followed the trace of the earlier Neoproterozoic suture zone. (3) South-dipping subduction along the northern margin of the Kunlun-Qaidam continent initiated in the Cambrian, first developing as the Yushigou supra-subduction zone (SSZ) ophiolite and then transitioning into the continental Qilian arc. (4) South-dipping subduction, arc magmatism, and the convergence between Kunlun-Qaidam and North China continued throughout the Ordovician, with a trench-parallel intra-arc strike-slip fault system that is presently represented by high-grade metamorphic rocks that display a pervasive right-lateral shear sense. (5) Counter-clockwise rotation of the peninsular Kunlun-Qaidam continent toward North China led to the closure of the Qilian Ocean, which is consistent with the right-lateral kinematics of intra-arc strike-slip faulting observed in Qilian Shan and the westward tapering map-view geometry of Silurian flysch-basin strata. 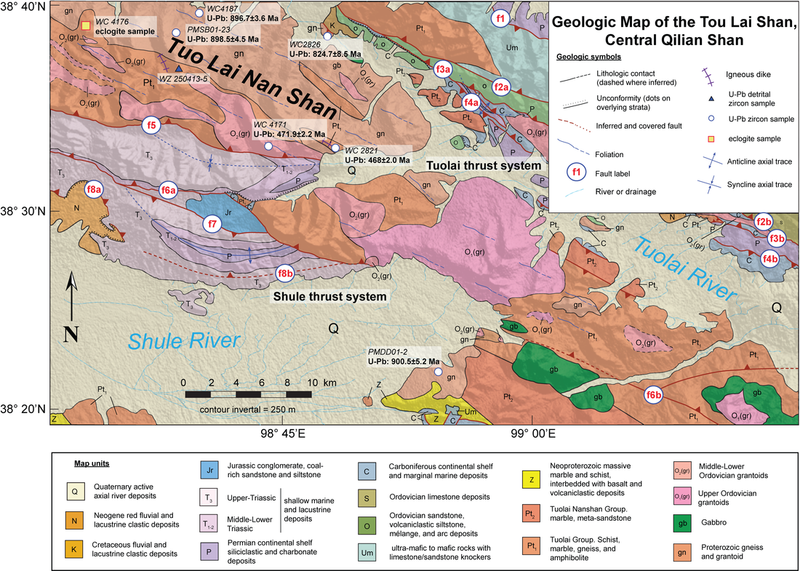 Continental collision at ~445–440 Ma led to widespread plutonism across the Qilian Shan and is recorded by recrystallized monazite (~450–420 Ma) observed in this study. Our tectonic model implies the parallel closure of two oceans of different ages along the trace of Qilian suture zone since ~1.0 Ga. In addition, the Qilian Ocean was neither the Proto- nor Paleo-Tethys (i.e., the earliest ocean separating Gondwana from Laurasia) as previously suggested, but was rather a relatively small embayed sea along the southern margin of the Laurasian continent. We also document >200 km of Cenozoic north-south shortening across the study area. The observed shortening distribution supports models of Tibetan Plateau development that involve distributed crustal shortening and southward underthrusting of Eurasia beneath the plateau. This India-Asia convergence-related deformation is focused along the sites of repeated ocean closure. Major Cenozoic left-slip faults parallel these sutures, and preexisting subduction-mélange channels may have facilitated Cenozoic shortening and continental underthrusting. What can strike-slip fault spacing tell us about the plate boundary of western North America? The spacing of parallel continental strike-slip faults can constrain the mechanical properties of the faults and fault-bounded crust. In the western US, evenly spaced strike-slip fault domains are observed in the San Andreas (SA) and Walker Lane (WL) fault systems. Comparison of fault spacing (S) versus seismogenic zone thickness (L) relationships of the SA and WL systems indicates that the SA has a steeper S/L slope (~8 vs 1, respectively). If a stress-shadow mechanism guides parallel fault formation, the S/L slope should be controlled by fault strength, crustal strength and/or regional stress. This suggests that the SA-related strike-slip faults are relatively weaker, with lower fault friction: 0.13–0.19 for the SA versus 0.20 for WL. The observed mechanical differences between the SA and WL systems may be attributed to variations in the local geology of the fault-hosting crust and/or the regional boundary conditions (e.g., geothermal gradient or strain rate). Whether continental deformation is accommodated by microplate motion or continuum flow is a central issue regarding the nature of Cenozoic deformation surrounding the eastern Himalayan syntaxis. The microplate model predicts southeastward extrusion of rigid blocks along widely-spaced strike-slip faults, whereas the crustal-flow model requires clockwise crustal rotation along closely-spaced, semi-circular right-slip faults around the eastern Himalayan syntaxis. Although global positioning system (GPS) data support the crustal-flow model, the surface velocity field provides no information on the evolution of the India-Asia orogenic system at million-year scales. In this work, we present the results of systematic geologic mapping across the northernmost segment of the Indo-Burma Ranges, located directly southeast of the eastern Himalayan syntaxis. Early research inferred the area to have experienced either right-slip faulting accommodating northward indentation of India or thrusting due to the eastward continuation of the Himalayan orogen in the Cenozoic. Our mapping supports the presence of dip-slip thrust faults, rather than strike-slip faults. Specifically, the northern Indo-Burma Ranges exposes south- to west-directed ductile thrust shear zones in the hinterland and brittle fault zones in the foreland. 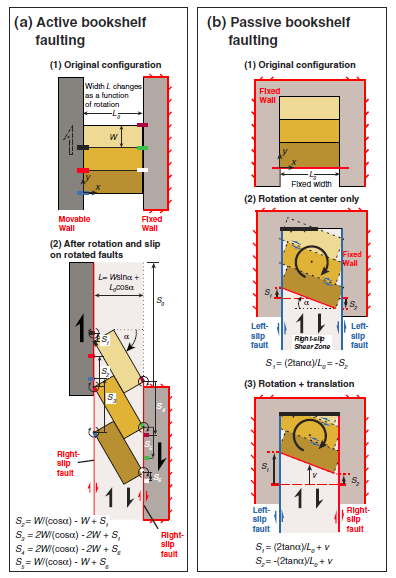 The trends of ductile stretching lineations within thrust shear zones and thrust sheets rotate clockwise from the northeast direction in the northern part of the study area to the east direction in the southern part of the study area. This clockwise deflection pattern of lineations around the eastern Himalayan syntaxis mirrors the clockwise crustal-rotation pattern as suggested by the crustal-flow model and contemporary GPS velocity field. However, our finding is inconsistent with discrete strike-slip deformation in the area and the microplate model. The Ediacaran and early Cambrian black shales are widespread across the South China Craton (Yangtze and Cathaysia blocks). However, the trace element distribution patterns of the Ediacaran and early Cambrian black shales in the Cathaysia Block are still unclear. In this study, thirtyfour black shale samples in the Lechangxia Group (Ediacaran) and thirteen black shale samples in the lower Bacun Group (early Cambrian) from Guangning area, western Guangdong Province, South China, were analyzed for major and trace elements concentrations. Compared to the upper continental crust, the Ediacaran black shales exhibit strongly enriched Se, Ga, and As with enrichment factor values (EF) higher than 10, significantly enriched Bi and Rb (10>EF>5), weakly enriched Mo, Ba, Cs, V, In, Be, Tl, and Th (5>EF>2), normal U, Cr, Cd, Sc, Pb, Cu, and Li (2>EF>0.5), and depleted Ni, Zn, Sr, and Co. Early Cambrian black shales display strongly enriched Se, Ga, and As, significantly enriched Ba, Bi, and Rb, weakly enriched Mo, Cs, Cd, V, U, Be, In, and Tl, normal Sc, Th, Cr, Li, Cu, Ni, and Pb and depleted Co, Zn, and Sr. Moreover, Se is the most enriched trace element in the Ediacaran and early Cambrian black shales: concentrations vary from 0.25 to 30.09 ppm and 0.54 to 5.01 ppm, and averaging 4.84 and 1.72 ppm, with average EF values of 96.87 and 34.32, for the Ediacaran and early Cambrian shales respectively. The average concentration of Se in the Ediacaran black shales is 2.8 times higher than that of early Cambrian black shales. Se contents in the Ediacaran and early Cambrian black shales exhibit significant variation (P = 0.03). Provenance analysis showed that Se contents of both the Ediacaran and early Cambrian black shales were without detrital provenance and volcanoclastic sources, but of hydrothermal origin. The deep sources of Se and the presence of pyrite may explain the higher Se contents in the Ediacaran black shales. Similar with the Se-rich characteristics of the contemporaneous black shales in the south Qingling Mountain and Yangtze block, the Ediacaran and early Cambrian black shales in Guangning area, Cathaysia, are also enriched in Se, which may provide a clue for looking for the selenium-rich resources in western Guangdong Province. The Phanerozoic history of the Paleo-Asian, Tethyan, and Pacific oceanic domains is important for unraveling the tectonic evolution of the Eurasian and Laurentian continents. The validity of existing models that account for the development and closure of the Paleo-Asian and Tethyan Oceans critically depends on the assumed initial configuration and relative positions of the Precambrian cratons that separate the two oceanic domains, including the North China, Tarim, Karakum, Turan, and southern Baltica cratons. Existing studies largely neglect the Phanerozoic tectonic modification of these Precambrian cratons (e.g., the effects of India-Arabia-Eurasia convergence and post-Rodinia rifting). In this work we systematically restore these effects and evaluate the tectonic relationships among these cratons to test the hypothesis that the Baltica, Turan, Karakum, Tarim, and North China cratons were linked in the Neoproterozoic as a single continental strip, with variable along-strike widths. Because most of the tectonic boundaries currently separating these cratons postdate the closure of the Paleo-Asian and Tethyan Oceans, we are able to establish a >6000-km-long Neoproterozoic contiguous continent referred to here as Balkatach (named from the Baltica–Karakum–Tarim–North China connection). By focusing on the regional geologic history of Balkatach’s continental margins, we propose the following tectonic model for the initiation and evolution of the Paleo-Asian, Tethyan, and Pacific oceanic domains and the protracted amalgamation and growth history of the Eurasian continent. (1) The early Neoproterozoic collision of the combined Baltica–Turan–Karakum–South Tarim continents with the linked North Tarim–North China cratons led to the formation of a coherent Balkatach continent. (2) Rifting along Balkatach’s margins in the late Neoproterozoic resulted in the opening of the Tethyan Ocean to the south and unified Paleo-Asian and Pacific Oceans to the north (present-day coordinates). This process led to the detachment of Balkatach-derived microcontinents that drifted into the newly formed Paleo-Asian Ocean. (3) The rifted microcontinents acted as nuclei for subduction systems whose development led to the eventual demise of the Paleo-Asian Ocean during the formation of the Central Asian Orogenic System (CAOS). Closure of this ocean within an archipelago-arc subduction system was accommodated by counterclockwise rotation of the Balkatach continental strip around the CAOS. (4) Initial collision of central Balkatach and the amalgamated arcs and microcontinents of the CAOS in the mid-Carboniferous was followed by a bidirectional propagation of westward and eastward suturing. (5) The closure of the Paleo-Asian Ocean in the early Permian was accompanied by a widespread magmatic flare up, which may have been related to the avalanche of the subducted oceanic slabs of the Paleo-Asian Ocean across the 660 km phase boundary in the mantle. (6) The closure of the Paleo-Tethys against the southern margin of Balkatach proceeded diachronously, from west to east, in the Triassic–Jurassic. Our understanding of the assembly history of Asia depends critically on the tectonic relationships between its major cratons, including Siberia, North China, South China, and Tarim. The intervening microcontinents between these cratons can provide insight into the paleogeographic and paleotectonic relationships of the cratons, but there is currently a general lack of knowledge regarding the basement geology of these microcontinents. Here we present results from systematic geologic mapping, U-Pb zircon dating, whole-rock geochemical analysis, and synthesis of existing data to establish the Proterozoic to early Paleozoic evolution of the central Qilian basement to the south of the North China craton in northwest China. Our results indicate that the region underwent three major periods of magmatic activity at 960–880, 877–710, and 550–375 Ma. Our geochemical analysis suggests that the ca. 900 Ma plutons were generated during arc magmatism and/or syncollisional crustal melting, whereas the ca. 820 Ma plutons are A-type granitoids, which are typically associated with extensional tectonism. Igneous zircons from a high- and ultrahigh-pressure eclogite in the north-central Qilian Shan have a U-Pb age of ca. 916 Ma, whereas dating of the recrystallized rims suggests that eclogite facies metamorphism occurred at ca. 485 Ma. Our detrital zircon geochronology also indicates that a widespread metasedimentary unit in the region was deposited between ca. 1200 and ca. 960 Ma, prior to the onset of a rift-drift event at ca. 750 Ma. Based on regional geologic constraints and the magmatic history, we propose the following tectonic history: (1) the paleo–Qilian Ocean bound the combined North Tarim–North China craton to the south (present-day coordinates) in the Mesoproterozoic; (2) the paleo–Qilian Ocean closed between 900 and 820 Ma following the collision of North Tarim–North China craton and the South Tarim–Qaidam–Kunlun continent; (3) the younger Qilian Ocean opened at ca. 775 Ma along the previous suture trace of the paleo–Qilian Ocean as a marginal sea within southern Laurasia; and (4) this ocean closed by ca. 445–440 Ma as a result of collision between the Tarim–North China cratons and the Qaidam-Kunlun continent along a south-dipping subduction system. The Chaobuleng iron polymetallic deposit, an important ore system in China that is genetically related to the early Cretaceous Chaobuleng pluton, is located in the eastern part of Lizi Shan-Dong Ujimqin Banner metallogenic belt of Inner Mongolia. To understand the relationship of magmatism and mineralization in this iron polymetallic deposit, we have conducted a detailed geologic field study in conjunction with systematic investigation of U-Pb zircon and Re-Os isochron geochronology, mineralogy, petrology, major-and trace-element geochemistry, and synthesis of existing datasets across the Chaobuleng region. We use these observations to identify the origins and petrogenesis of mafic enclaves and the host granitoid, and to place new constraints on the tectonic setting at the time of magmatism. New U-Pb geochronology of magmatic zircons and Re–Os isochron ages of hydrothermal molybdenite from the iron polymetallic deposit allow us to constrain the sources of the hydrothermal components and the relationship between iron polymetallic mineralization and regional geodynamic evolution. The geology, paragenesis, and estimated P-T conditions suggest that the Chaobuleng iron polymetallic deposit was formed as a shallow, proximal skarn deposit. The ore-forming early Cretaceous Chaobuleng pluton can be divided into three distinct units based on crystallization age, texture, and composition: (1) a 138.1–140.6 Ma syenogranite porphyry, (2) a 137.4–138.6 Ma enclave bearing porphyritic syenogranite, and (3) a 133.9–135.98 Ma coarse-grained porphyritic syenogranite. We suggest that the A-type Chaobuleng pluton was formed in a post-orogenic extensional setting with significant magma mixing from high-temperature melts (i.e., a Zr saturation temperature of 800–900°C). During the magmatic process, the Chaobuleng pluton crystallized under temperatures as low as 720–770°C and pressures of 0.5–1.0 kbar. The chemical composition of biotite shows that the Chaobuleng magma was enriched in F (1.5–3.5%). We attribute the observed embayed texture of quartz to a three coexisting-phase equilibrium model that operated during the magmatic-hydrothermal transition and can be used to constrain the mineralization process and physico-chemical conditions. Due to a loss of volatiles, the residual melt was quickly quenched and crystallized into a fine-grained groundmass. The Re–Os model ages of samples from the inner pluton-mineralization contact belt are 135.0 ± 2.1 Ma and 131.2 ± 4.1 Ma, and a sample from the outer-contact belt yields an isochron age of 140.7 ± 1.8 Ma. The Chaobuleng deposit formed during protracted activity of the magmatic-hydrothermal system, which is similar to many mineralization systems around the world. However, the major mineralization stage (iron oxide stage) of the Chaobuleng deposit occurred during the early stage of magmatism, consistent with the emplacement time of syenogranite porphyry at ~139 Ma. system in California. We show that the average friction coefficient of strike-slip faults in the India-Asia collisional orogen is lower than that of faults in the San Andreas fault system. Weaker faults explain why deformation penetrates >3500 km into Asia from the Himalaya and why the interior of Asia is prone to large (M > 7.0) devastating earthquakes along major intra-continental strike-slip faults. Our new approach of estimating absolute fault strength may be useful in future studies of continental deformation and earthquake mechanics. Collision-induced continental deformation commonly involves complex interactions between strike-slip faulting and off-fault deformation, yet this relationship has rarely been quantified. In northern Tibet, Cenozoic deformation is expressed by the development of the > 1000-km-long east-striking left-slip Kunlun, Qinling, and Haiyuan faults. Each have a maximum slip in the central fault segment exceeding 10s to ~ 100 km but a much smaller slip magnitude (~< 10% of the maximum slip) at their terminations. The along-strike variation of fault offsets and pervasive off-fault deformation create a strain pattern that departs from the expectations of the classic plate-like rigid-body motion and flow-like distributed deformation end-member models for continental tectonics. Here we propose a non-rigid bookshelf-fault model for the Cenozoic tectonic development of northern Tibet. Our model, quantitatively relating discrete left-slip faulting to distributed off-fault deformation during regional clockwise rotation, explains several puzzling features, including the: (1) clockwise rotation of east-striking left-slip faults against the northeast-striking left-slip Altyn Tagh fault along the northwestern margin of the Tibetan Plateau, (2) alternating fault-parallel extension and shortening in the off-fault regions, and (3) eastward-tapering map-view geometries of the Qimen Tagh, Qaidam, and Qilian Shan thrust belts that link with the three major left-slip faults in northern Tibet. We refer to this specific non-rigid bookshelf-fault system as a passive bookshelf-fault system because the rotating bookshelf panels are detached from the rigid bounding domains. As a consequence, the wallrock of the strike-slip faults deforms to accommodate both the clockwise rotation of the left-slip faults and off-fault strain that arises at the fault ends. An important implication of our model is that the style and magnitude of Cenozoic deformation in northern Tibet vary considerably in the east–west direction. Thus, any single north–south cross section and its kinematic reconstruction through the region do not properly quantify the complex deformational processes of plateau formation. Competing models that account for the construction of the Tibetan Plateau include continental subduction, underthrusting, distributed shortening, channel flow, and older crustal-structure inheritance. Well-constrained estimates of crustal shortening strain serve as a diagnostic test of these plateau formation models and are critical to elucidate the dominant mechanism of plateau development. In this work we estimate the magnitude of Cenozoic shortening across the northern Qilian Shan–Nan Shan thrust belt, along the northeastern plateau margin, based on detailed analysis and reconstruction of three high-resolution seismic reflection profiles. By integrating surface geology, seismic data, and the regional tectonic history, we demonstrate that this thrust system has accumulated >53% Cenozoic strain (∼50 km shortening), accommodated by several south-dipping thrust faults. Based on the observed strain distribution across northern Tibet, including lower strain (30%–45%) within the interior of the Qilian Shan–Nan Shan thrust belt, we suggest that a combination of distributed crustal shortening and minor (<250 km) southward underthrusting of the Asian lithosphere is responsible the development of the northern Tibetan Plateau. Focused shortening along the Qilian Shan frontal thrust system accommodates much of the present-day convergence between Tibet and North China, which implies that the northern plateau margin may have developed in a similar manner to that of southern Tibet through Himalayan-style continental underthrusting. We also argue that the Qilian Shan–Nan Shan, North Qaidam, and Qaidam Basin thrust systems have absorbed a minimum of 250–350 km north-south Cenozoic shortening, which is double the commonly cited value of ∼150 km. In order to better constrain the evolution of the Tethyan orogenic system, we conducted an integrated investigation involving U-Pb dating of igneous and detrital zircon, geochemical analysis of igneous rocks, compositional analysis of sedimentary strata, and a synthesis of existing work across the Qilian Shan, Qaidam Basin, and the Eastern Kunlun Range of central and northern Tibet. This effort reveals five stages of arc magmatism at 1005–910 Ma, 790–720 Ma, 580–500 Ma, 490–375 Ma, and 290–195 Ma, respectively. Arc activities were interrupted by repeated continent-continent collision followed by ocean opening along the older suture zones first created in the Neoproterozoic. This suggests that Wilson cycles have played a controlling role in constructing the southern Asian continent. The magmatic history and regional geologic constraints allow us to construct a coherent tectonic model that has the following key features. (1) The linked South Qilian suture in the west and North Qinling suture in the east formed the northern boundary of the coherent Kunlun–Qaidam–North Qinling Terrane in the early Paleozoic. (2) The Songpan-Ganzi Terrane has been the western part of the Yangtze craton since the Neoproterozoic. (3) Development of the wide (>700 km) Permian–Triassic arc across the Kunlun-Qaidam Terrane was induced by flat subduction and rapid slab rollback, which also caused extreme extension of the Songpan-Ganzi Terrane. (4) The formation of the Anymaqen-Kunlun-Muztagh Ocean (= the Neo–Kunlun Ocean in this study) was created within Laurasia rather than being a preexisting ocean between Gondwana and Laurasia as postulated by most early studies. We present the first mechanical analysis based on realistic rheology and boundary conditions on the formation of evenly spaced strike-slip faults. Two quantitative models employing the stress-shadow concept, widely used for explaining extensional-joint spacing, are proposed in this study: (1) an empirically based stress-rise-function model that simulates the brittle-deformation process during the formation of evenly spaced parallel strike-slip faults, and (2) an elastic plate model that relates fault spacing to the thickness of the fault-hosting elastic medium. When applying the models for the initiation and development of the tiger-stripe fractures (TSF) in the South Polar Terrain (SPT) of Enceladus, the mutually consistent solutions of the two models, as constrained by the mean spacing of the TSF at ∼35 km, requires that the brittle ice-shell thickness be ∼30 km, the elastic thickness be ∼0.7 km, and the cohesive strength of the SPT ice shell be ∼30 kPa. However, if the brittle and elastic models are decoupled and if the ice-shell cohesive strength is on the order of ∼1 MPa, the brittle ice shell would be on the order of ∼10 km. A 180-km-long, high-resolution seismic-reflection survey that imaged the entire crust and the uppermost mantle lithosphere was conducted across the northeastern Tibetan Plateau. This work had three aims: (1) to examine whether the left-slip Haiyuan and Tianjing faults defining the margin of NE Tibet are crustal- or lithospheric-scale structures, (2) to determine whether seismic fabrics are consistent with middle- and/or lower-crustal channel flow, and (3) to establish the minimum amount of Cenozoic shortening strain in the region. Analysis of our newly obtained seismic-reflection data suggests that the left-slip Haiyuan and Tianjing faults have multiple strands and cut through the upper and middle crust. The faults likely terminate at a low-angle detachment shear zone in the lower crust, because the flat Moho directly below the projected traces of the faults is continuous. The seismic image displays subvertical zones of highly reflective sequences containing parallel and subhorizontal reflectors that are truncated by seismically transparent regions with irregular shape. The transparent regions in the middle crust are traceable to the seismically transparent lower crust and are interpreted as early Paleozoic plutons emplaced during the construction of the Qilian arc in the region. The presence of the undisturbed subvertical contacts between zones of highly reflective and seismically transparent regions rules out the occurrence of channel flow in the middle crust, as this process would require through-going subhorizontal reflectors bounding the channel above and below. The lack of continuous reflectors longer than a few kilometers in the lower crust makes a laminar mode of channel flow unfavorable, but lateral lower-crustal flow could have occurred via small-scale ductile deformation involving folding (less than a few kilometers in wavelength and amplitude). Integrating surface geology and the seismic data, we find that the upper crust along a segment of the seismic surveying line experienced up to 46% crustal shortening postdating the Cretaceous and is thus interpreted as entirely accumulated in the Cenozoic. If the estimated shortening strain is representative across northeastern Tibet, its magnitude is sufficient to explain the current elevation of the region without an appeal for additional contributing factors such as channel flow and/or a thermal event in the upper mantle.